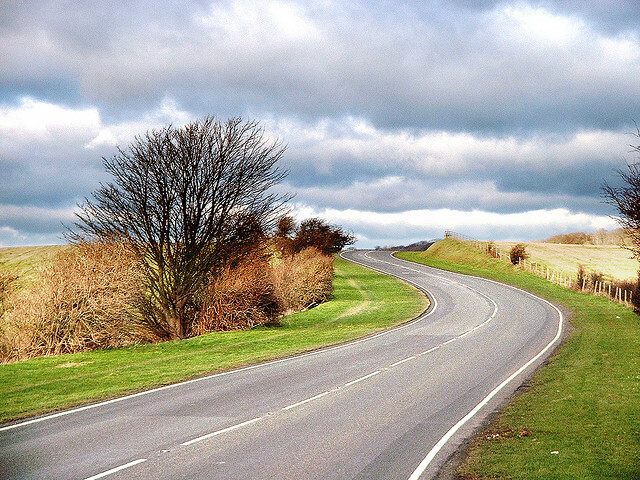 Residents of East Sussex County Council and Hart District Council can now report potholes, broken street lights, and other local issues, simply and speedily. 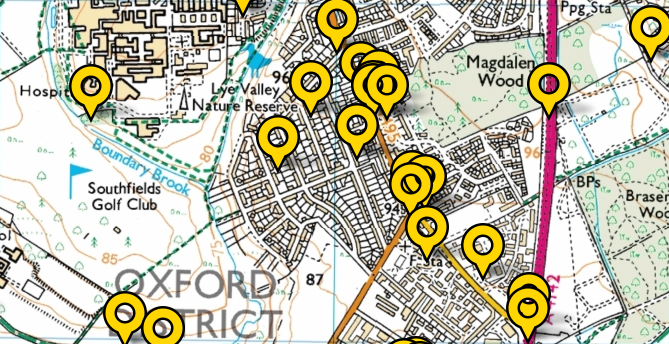 The two local authorities are the latest to integrate FixMyStreet onto their own websites. 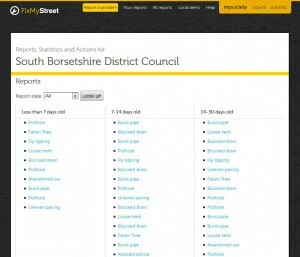 Whether reports – and subsequent updates – are made on the councils’ websites, or within their boundaries on FixMyStreet.com, they will be published on both the council site and FixMyStreet. FixMyStreet is a proven aid to channel shift, moving report-making online, to save time and money for both residents and councils. Hart and East Sussex’s adoption of the software is just one strand of their ‘digital by default’ approach to transactional services. If you’re from a council, and would like to find out more about FixMyStreet for Councils, everything you need to know is here. You may be familiar with WhatDoTheyKnow, our website which simplifies the process of making a freedom of information request. 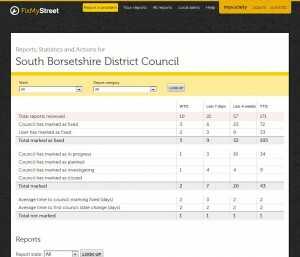 mySociety also provides the underlying software as a service for councils: it sits on the council website, templated and branded to fit their site’s style. When someone submits a request, it goes directly into the council’s own back-end processes. Just like WhatDoTheyKnow, the system publishes all requests, and their answers, online. This helps the council show a commitment to transparency – it also has the effect of cutting down on duplicate requests, since users can browse previous responses. Brighton and Hove Council are the first council to implement the software. Now, ordinarily, when we sign off a new project for a client, we write up a case study for our blog. But this time, we were delighted to read an interview by Matt Burgess on FOI Directory, which has done all the hard work for us. With Matt’s permission, we are reproducing the piece in full. The number of Freedom of Information requests public authorities receive is generally rising and central government dealt with more requests in 2012 than in any year since the Act was introduced. One council has decided to try and open up access to their requests using custom software from mySociety. Brighton and Hove City Council have implemented a custom version of the popular WhatDoTheyKnow website where more than 190,000 requests have been made. The council hope it will allow others to easily browse requests that have been made and make them more accountable. We spoke to council leader Jason Kitcat about why the council decided to implement the new system – which was soft-launched at the beginning of November. Why did you decide to implement the new system? JK: I personally, and we collectively as a Green administration, believe passionately in openness and transparency. That’s the primary motivation. So digital tools to support making it easier for citizens to access council information I think are strongly in the interest of our city and local democracy. We also were seeing an increase in the number of FOI requests, many of them similar. So using a system like this helps people to find the information that’s already published rather than submitting requests for it, when it’s actually already been published. JK: It’s a customised version of the mySociety WhatDoTheyKnow site, delivered by mySociety for us in the council’s branding. It allows anyone to submit their FOI request in a structured way through the web and others can see the requests and any responses. The requests are linked in with the main WhatDoTheyKnow site to help further reduce duplication of requests and enable consistent commenting. Behind the scenes it also offers workflow management to assist the council team who are responding to the requests. What benefits will the system have to those answering and making FOI requests? JK: It opens up the process, helps others to see what is going on even if they aren’t making requests themselves. Particularly important is that it by default puts requested information out there on the web without any more effort by the council or those making the requests. Were there any obstacles in setting the system up and how much did it cost the council? JK: Obstacles were mainly stretched resources within the council to prepare for the changed workflow, making sure our information governance was ready for this and that our web team could support the minor integration work needed. Given this is a web-based ’software as a service’ offering it’s pretty straightforward to implement in the grand scheme of things. I don’t have the final costs yet as we’ve been doing some post-launch tweaks but, as is the way with nimble organisations like mySociety, I think pricing is very reasonable. Do you think it will improve the council’s performance in responding to FOI requests and make the council more transparent to the public? JK: Yes absolutely. Not only will the council’s FOI performance be more publicly accountable but I’m hoping we can reduce duplicate requests through this so that our resources are better focused. Would you say it has been worth creating and why should other public authorities follow suit? JK: Yes it’s worth it. I think we as councils have to be ever more open by default, use digital tools for transparency and relentlessly publish data. I believe this will result in better local democracy but also is one of the ways we can truly challenge cynicism in the whole political system. N.B. : The website current shows a large number of requests that appear to be unanswered. We asked about these and it includes the number of historic requests that were loaded into the site. Many thanks to Matt of FOI Directory for allowing us to reproduce this interview in full. So, before you know it, by keeping it simple at the start, we’ve got your journey under way — you’re “in”, the site’s already helping you. It’s showing you a map (a pretty map, actually) of where your problem is. Of course we’ve made it as easy as possible for you to use that map. You see other problems, already reported so maybe you’ll notice that your pothole is already there and we won’t have wasted any of your time making you tell us about it. Meanwhile, behind the scenes, we now know which jurisdictions are responsible for the specific area, so the drop-down menu of categories you’re about to be invited to pick from will already be relevant for the council departments (for example) that your report will be going to. Of course there’s a lot more to it than this, and it’s not just civic sites like ours that use such techniques (most modern e-commerce sites have realised the value of making it very easy to take your order before any other processing; many governmental websites have not). But we wanted to show you that if you want to build sites that people use, you should be as clever as a magician, and the secret to that is often keeping it simple — deceptively simple — on the outside. FixMyStreet.com has always tried to make it as simple as possible to report a street problem. 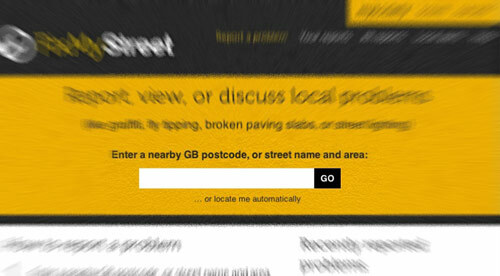 When we built FixMyStreet for Councils, we wanted to simplify things for local authority employees too. So, as well as offering the option to integrate with council back-end systems, we also put together this nifty dashboard (right – click to see full-size). 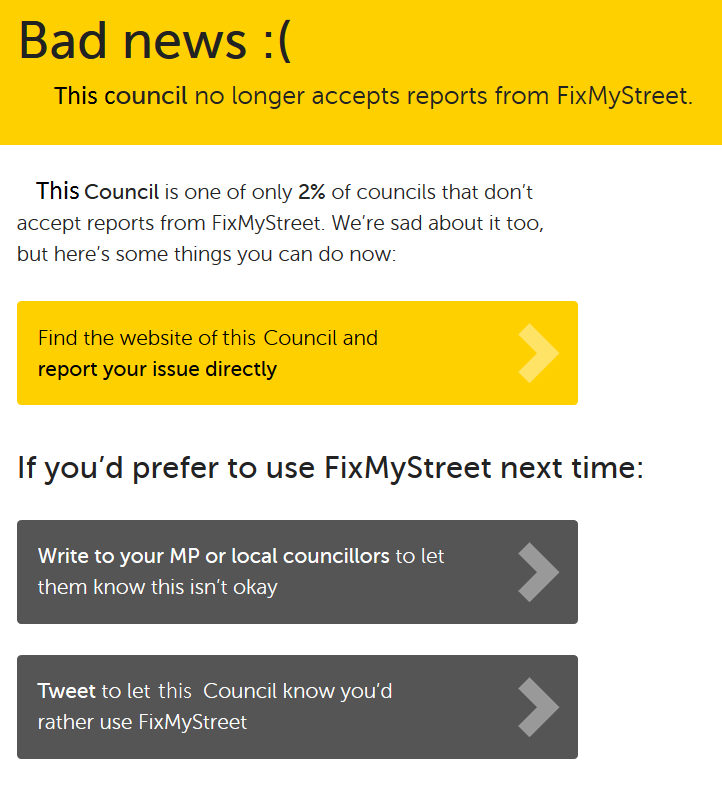 It’s one of several extra features councils get when they purchase the FixMyStreet for Councils package. At-a-glance statistics, for all kinds of reporting. Perhaps the local newspaper have asked how many potholes have been fixed this year, or internal staff need a report on which types of problem are most rapidly fixed. The top half of the dashboard allows for this sort of analysis. 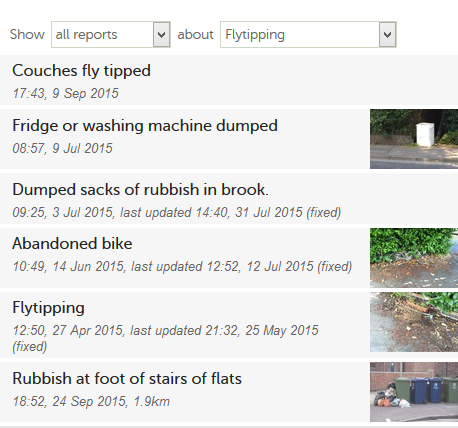 The drop-down category list means you can filter the view to show one category of problem – say, fly tipping – or all of them. Results are shown across a variety of timeframes. 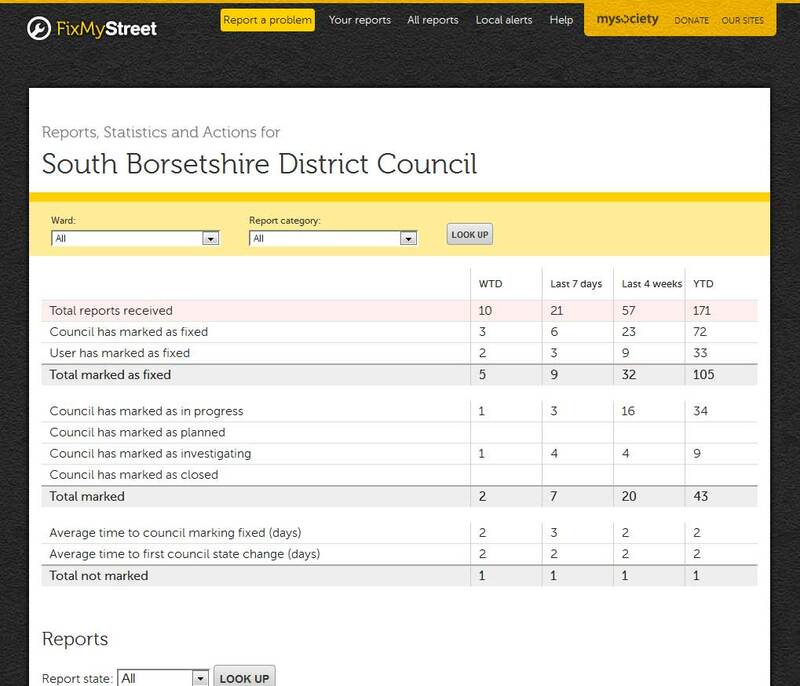 FixMyStreet for Councils allows councils to designate their own progress statuses, beyond our standard ‘fixed’ and ‘open’. So, in this case, the statuses include ‘in progress’, ‘planned’, ‘investigating’, etc. Each of these is shown separately. A realistic picture of how long it takes to deal with issues. The ‘average time to council marking as fixed’ is a great measure of just how much time it is taking to get reports resolved. Perhaps just as important, though, is the ‘average time to first council state change’ – that could just mean the report has been acknowledged, or that its status has changed to ‘under investigation’ – but these are still valuable mileposts for keeping residents informed of progress. Quick access to problems, as they’re reported. 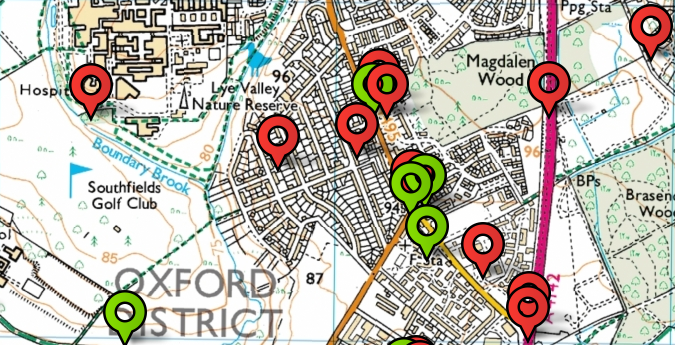 At the foot of the dashboard, there are links to all problems reported within the council boundaries. There’s an option to filter them by any of the statuses, as above. Access for multiple people, in different locations. The dashboard is web-based, so it can be accessed by any employee with internet access – or several at once. But at the same time, complete security. It’s password-protected, so it’s only accessible to those who have been granted access. A responsive provider. mySociety believe that the launch of new software is only the beginning of the story. When people start using new products, they often do so in surprising ways. They often ask for features that would never have occurred to us, and indeed might never have previously occurred to them. We will remain in active development, of the dashboard, and of FixMyStreet for Councils as a whole. We’ll be soliciting feedback, and listening to it very carefully. 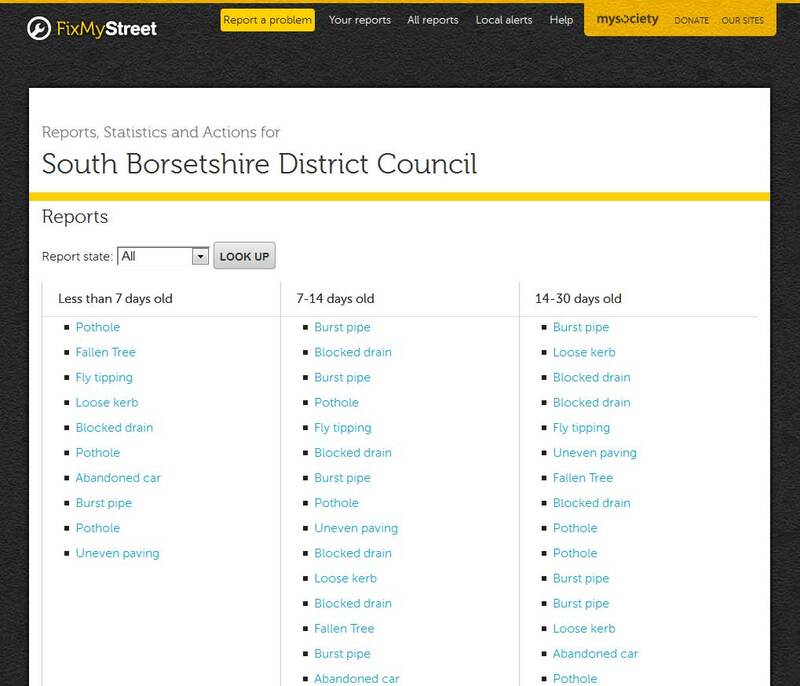 The FixMyStreet for Councils dashboard is only available to councils as part of our FixMyStreet for Councils package – find out more here. Over the last 6 months or so, mySociety has been doing increasing amounts of work with local councils, not only helping them with problem reporting and online petitions, but also advising them on the impact of digital by default and how changing customer expectations are affecting digital service provision. To paraphrase Tom, for an ever-increasing number of customers, “local councils don’t have websites, local councils are websites”. More specifically, we’ve been helping councils use user-centred techniques to kick-start the process of digital transformation: taking existing services that cause unnecessary frustration, figuring out how they should work for the customer in an ideal world, identifying the process changes needed, and helping make them happen. Most consultancies in this area will publicise their patented 5-step approach, or shower you in platitudes about talking to users and involving service managers, but I thought it would be more useful to walk through in detail what we actually do on a project like this. In this post, I’m going to describe only the first step (I’ll talk about others in future posts): given all the stuff that councils do, how do you know where to start? Clearly, not every council service is susceptible to digital transformation. If you work in children’s services or benefits advice, your service is more likely to rely on cups of tea and conversation than on your website. But there are high volume transactions that involve exchanges of information or of money that do not, or rather *should not*, require any human intervention. Unfortunately, because of mistakes in how websites are structured and processes organised (that often go right back to decisions about management structure and procurement priorities), unnecessary demand is placed on contact centres. What are your users trying to do? Contact centre logs: the records of what people who call you are actually asking about. This is the best place to look to identify the areas where your web presence is under-performing. Internal site search terms: the things people type in most often in the search box on your website. Generally speaking, use of search on a website is an indicator that your navigation and page structure have failed. Therefore the search terms people use on your site are another very interesting indicator of things you’re not doing well enough. Referring search terms: the most frequently used search terms that drive traffic to your website. What are people looking for and what words have they actually put in to Google (or indeed any other search engine) for to arrive at your website? Popular pages: data on the most frequently visited pages and sections of your website doesn’t tell you what you should improve or how, but it does give you a feel for where the demand is. If you look at all of those things, you’ll have a lot of data to go through and make sense of. If you’re short on time, focus on the first one – it’s the juiciest source of insights. Another approach we pursue in parallel to this one is to talk to a group of service managers and ask them for their opinions: if the decision on where we should focus our redesign efforts was up to them, what single thing should we start with that would make the biggest difference? How this actually happens in practice is that we get a group of people in a room together and ask them to write down (almost certainly on post-it notes) the top 3 – 5 services that they think are in need of a digital redesign. We then discuss and consolidate all of these before grouping them, trying to identify those that are the most susceptible to automation and where the complexity of the change needed internally is low enough to be approachable. The final part of figuring out where to start is to make a decision: which of these areas are you going to start redesigning first? You now have two sources of data on where to start: the results of your analysis of customer behaviour and the views of your employees who are closest to the action. Here we’ll make a recommendation, but leave the final decision to our council client: they know their organisation a lot better than we do. With a focal point for the transformation efforts decided on, so begins the daunting-yet-exciting task of researching and designing the changes to be made: the bit where you actually talk to users, make prototypes or mockups of what the service’s digital touchpoints should look like (no specification documents here please) and then figure out together what process changes need to be made for it all to work in practice. Which, of course, are the topics for future blog posts. Quick question – don’t think too hard about it: what is Amazon? At one level, Amazon is the world’s largest online retailer, a public company listed on the NASDAQ. At another level – the physical – it is a collection of over 50,000 employees, hundreds of warehouses and zillions of servers. But for most people Amazon is fundamentally a website. Sure, it’s an extremely impressive website that can send you parcels in the post, and which can relieve you of money with terrifying ease. But to most people the company has very little reality beyond the big white-blue-and-orange website and the brown cardboard packages. The same process is happening to the bits of the government that I interact with – the physical reality of bricks and mortar and people and parks is starting to disappear behind the websites. Government is increasingly a thing I don’t have any mental images of. I don’t know what my local council looks like, nor am I even clear where it is. I’m sure you all have plenty of interactions with HM Revenue and Customs, but do you know where it is or what it looks like? Increasingly, when I form a mental image of a branch of government in my head, what I see is the website. What else am I supposed to picture? Governments no longer just ‘own‘ websites, they are websites. Wait! Stop shouting! I know how this sounds. I am not so out of touch that I don’t know that there are plenty of people out there who are only too familiar with the physical manifestations of government. They see the government as manifested through prison, or hospital, or the job centre. They have no problem forming a vivid mental image of what government means: a waiting room, a queue, a social worker. And I also know that most of the poorest people in the UK aren’t online yet. It’s one of the great challenges for our country in the next decade. The majority of citizens don’t have deep, all encompassing, everyday interactions with the state – at most they drop their kids at school every day, or visit the GP a few times a year. That’s as physically close as they get. To these people, interacting with government already feels somewhat like interacting with Amazon. It sends them benefits, passports, recycling bins, car tax disks from mysterious dispatch offices and it demands money and information in return. The difference is in emotional tone – the Amazon online interactions tend to be seamless, the government online interactions either painful or impossible – time to pick up the phone. Increasingly, when a modern citizen looks at a government website, they’re literally seeing the state. And if what they see is ugly, confusing or down-right-broken, increasingly that’s how they’re going to see the state as a whole. This change in public perception means that a previously marginal problem (bad websites) is now pointing towards a rather more worrying possibility. As government websites continue to fall behind private sector websites, governments will slowly look less and less legitimate – less and less like they matter to citizens, less and less like we should be paying any taxes to pay for them. Why pay for something you can’t even navigate? It is time for the directors and CEOs of public bodies everywhere to wake up to this possibility, before the ideologues get hold of it. I don’t buy the argument that government websites are bad because all the ubermensch have gone off to work for the private sector. The public sector can often teach the private sector a lot about information design, like British road signs and tube maps, which are fantastic. And, of course, there’s the super team at Gov.uk, who represent the kind of change I’m writing about here. The real difference is one of management structure and focus. At Amazon, CEO Jeff Bezos and his executive colleagues worry all the time about whether their site or app or Kindle are as good as the competitors. But in central and local governments around the world, the top bosses do not stress every day about whether the user experience of their website is up to scratch, or whether conversion rates are lower than desirable. The main reason that they don’t worry is because their management boards don’t historically contain anyone whose job it is to worry about the performance of digital services. A council chief exec will worry about finance because their finance director will constantly be nagging them about money. But a council CEO won’t be worrying about whether 10,000 people left their website bitterly disappointed last week, because such issues are not ‘normal things to discuss’ at a board level. The solution, at least in the near term – is to recruit or promote people with digital remits and experience right to the top tier of decision making in government bodies. It means creating new roles like ‘CIO’ or ‘Head of Digital’ which have the same seniority as ‘Head of Adult Social Care’ or ‘Head of HR’. And it means empowering those people to make painful changes that are required to make digital services become brilliant and user-centric. Clearly, this presents dangers. How do you know what powers to give the new role? How do you stop them damaging critical services? And, most problematic of all – how can you tell that a digital expert isn’t a charlatan? After all, they have niche expertise that you don’t have – how are you supposed to sniff them out? The answer is that it isn’t easy, and that a lot of knowledge sharing and learning from mistakes will be required. As a shameless plug – we can help here – we can help vet candidates and define their roles in Britain and abroad. But none of this hides the fact that becoming digital – learning to run a public organisation that is a website, will be a fraught affair. The reward, though, is nothing less than helping to guarantee the ongoing legitimacy of government (quite apart from all the happier customers). To me that seems well worth going through some pain for.